Your first car that is. Phil B here kicking off what I hope will not be a singular effort to describe in some detail my first car and the brief but very deep attachment I had to it. I would like to invite you all to submit your own story since I think everyone can relate to a "first car" memory. Me and mine are on the left. I was competing in a downhill mountain bike tournament. 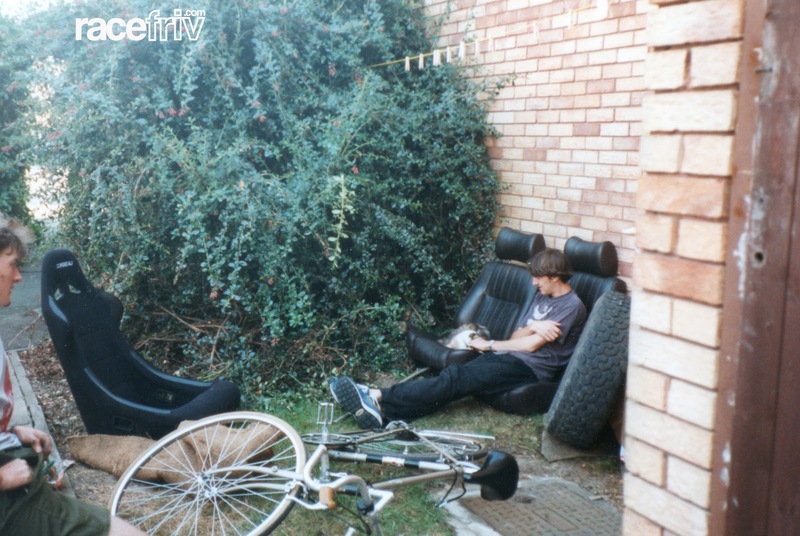 Sometime in the late 1990's. My interest in cars started late. In Britain you may drive from the age of 17, although you can get your learners permit at 16. 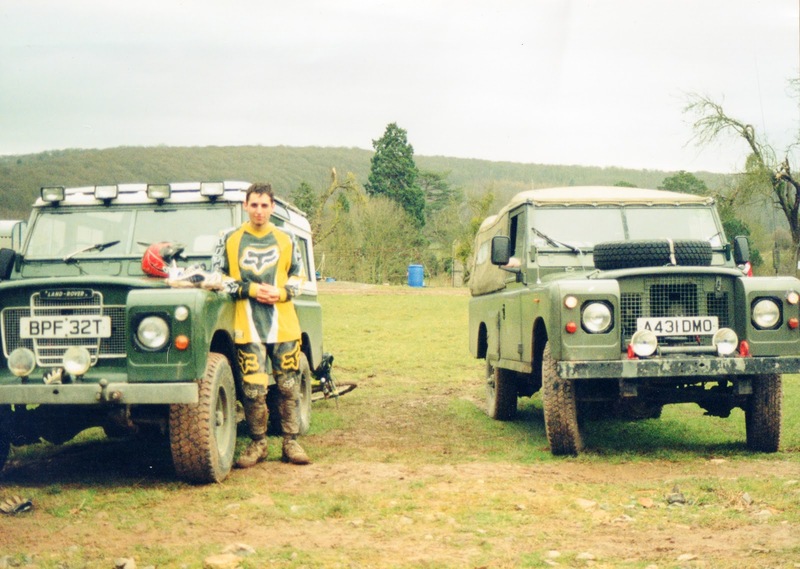 I did things a little differently, focusing my teenage years on mountain biking. I went to University in London, where the bike, bus and train could take me anywhere I needed. It wasn't until graduation time in my early 20's that I finally got the urge to learn to drive and get myself transport. 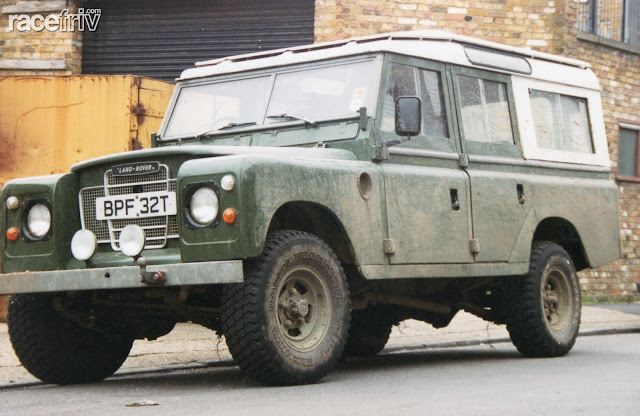 My Grandmother helped with a small cash infusion (I was unemployed after graduation for a few months) and I fell in love with a ratty looking Landrover parked in someones front yard about a 1/4 mile from my London flat. My friend Steve had a Landrover, not a range rover, not a discovery, but what we referred to as a "proper" Landrover - a Series III. From 1948 to the modern day "defender" a few small changes in the design have crept in. Despite the jokes made on Top Gear these things last for eternity. I think this is what the cockroaches will drive after the nuclear holocaust. An estimated 70% of all of these things ever made are estimated to still be registered and roadworthy. After over 50 years of production that's an amazing figure. The British designers admit being inspired by the Willys jeep, but Landrover aficionados will energetically inform of its superiority to all things Jeep since they "improved on the design". Over the years numerous versions were made and used on farms, in the military and in all manner of custom applications. The Landrover saw service during many military conflicts and was used all over the former British empire. From Australia to Africa, Singapore to São Paulo the Landrover is known for its capabilities and versatility. marketing for the Landrover focused on its sheep herding abilities. The sign on my dream car suggested a price of 2500 of her majesty's pounds sterling. Thats almost $4000 American beer coupons. Since I was convinced that this mighty war horse was worth many times the asking price (based on my extensive knowledge of nothing) I paid the price on the window without hesitation or haggle. I should have haggled. A lot. I had to get a friend to drive it back to my flat since at that time I hadn't finished driver training (which in Britain is a fairly extensive program designed to make you want to ride the bus for ever). The friend was able to explain all the things that were wrong with the vehicle very easily: Like not having satisfactory brakes, wobbly steering, barely any power in the engine, the usual stuff you expect from a luxury conveyance. It sat parked in the lot outside the flat looking pretty sad, leaking fluids and urging me to fix it up. I didnt have much choice since there was no way I could sell it and get my money back out. So I grabbed a shovel and starting digging myself deeper into the hole. I spent the next couple of unemployment checks on parts, tools and pizza. 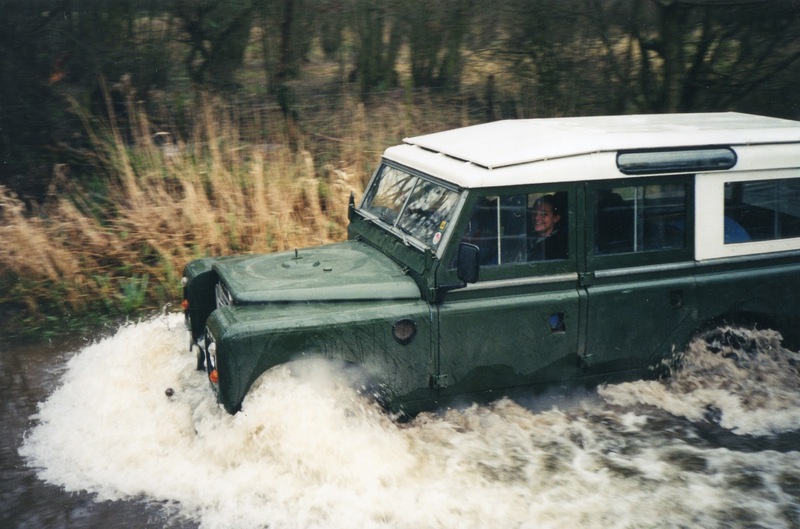 Once a week my driving instructor would stop by and pick me up for my lesson in his small Japanese car and each week the "Landy" appeared to look worse and worse. The previous owner was of the bailing twine, 2x4 and self tapping screw persuasion. I had to undo a lot of ugly. My friend had a series III although his had the more common 4 cylinder engine, his expertise, and patience was very helpful. Mine had the almost unicorn like rare 6 cylinder engine which was totally different in design and for which parts were scarce. 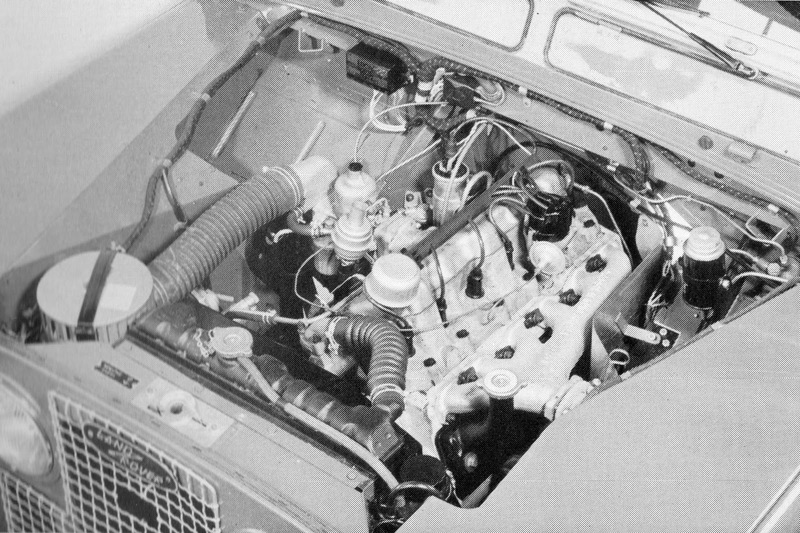 The engine was designed in the late 40's and used in the 50's and 60's in the Rover P series cars (like the P4 for example) this is the only picture I can find anywhere of the engine. I had to scan this from an old book myself. 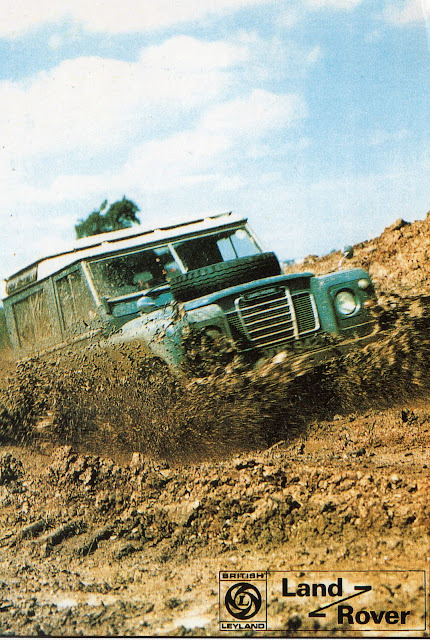 From the book "Land Rover 1948-1983" by James May Taylor. The engine was a 2.6 liter IOE engine, meaning the intake valves were in the head (in this case an aluminum head with integrated intake manifold) and the exhaust valves were in the block. The cam in the block worked the exhaust valves via a simple rocker shaft. 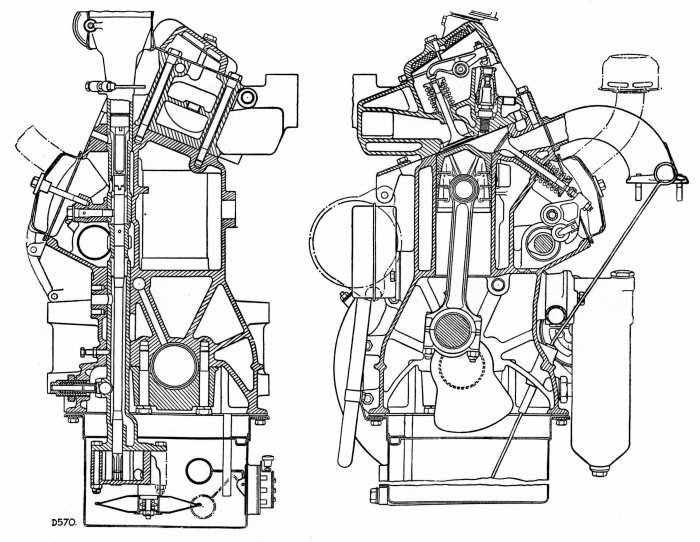 The intake valves were operated by push rods. I did read that the very small bore and long stroke made the car cheaper to own during an odd period when cars in Britain were taxed based on engine bore size. I had a Zenith Carb and the one I had was an emissions controlled lean burn carb so it ran like total crap. I found an adjustable carb at a junkyard which enabled me to improve it to run like smoking crap. Apparently I wasn't far from the factory specs because the lump was good for a 0-60 run of about 20 seconds and a top speed of about 80mph. This was apparently normal and an indication of healthy operation. Lets ignore that rod knock sound for now then. 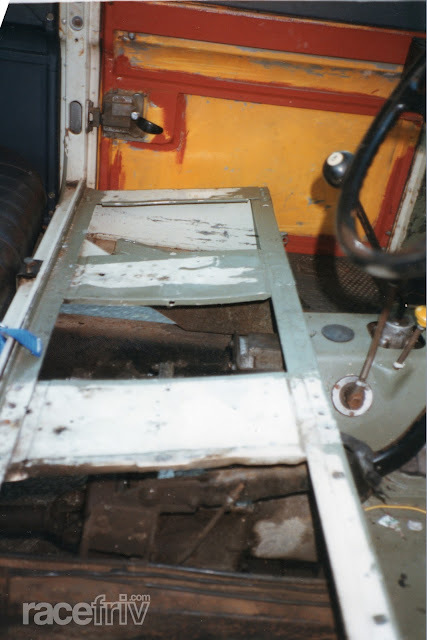 The front seats removed: you to get some idea of the variety of paint colors used throughout. The brakes needed work. Meaning I needed a new master cylinder, lines, wheel cylinders, drums and assorted hardware. The good news was that the pedal worked. All over the body was layers upon layers of paint apparently the 22 years of life this machine had before my purchase required a coat of many colors. I suspect that paint had lead in it because I went totally mad sanding it all off. Landrover started building these in the years after world war II and used aluminum for body panels. I recall some sort of reasoning involving steel shortages and scrap metal from the aircraft industry but I think they just wanted them to last for ever. This was lucky since it meant rust was isolated to the unimportant areas of the car that couldn't easily be seen from my initial inspection. Like the chassis. I set about painting it with a hunter green and white scheme to cover up the shameful camo pattern the previous owner had thoughtfully applied in the thickest possible layers. Although I was painting it with a brush I was using paint designed for that and it settled into a nice smooth enamel coating that proved to be very durable. Then having put racing seats in with harnesses I was ready to ruin it. I got a job, passed my driving test, and got to take her for the first drive. the next two years were a blur of offroading, exploding exhausts, cylinder head milling, chassis welding bliss. One time just for fun I was able to fit 17 people in it. I slept in it, crashed it, fixed it, broke the front diff and generally loved it to bits. My friends Steve (left) and Doug (petting cat). The brown vinyl seats came out, and the Corbeau racing seats went in. All done in the comfort of the parking lot in front of the flats. In hindsight a project this intense wasn't a good choice for a first car in the city, nor a vehicle with 4 shift knobs (4 speed with an 8-ball as a knob, the overdrive lever, low range, and high range 4x4 selectors). Thanks to my friends I was able to work it all out. Every fairly tale must come to an end of course. When I transferred to the US I had to sell all the things that I couldn't take with me. I had only a few weeks to prepare. In a panic I sold it to the first interested person, a work colleague - who paid 350 pounds. Clearly I wasn't cut out to be a car dealer. I'm just going to admit right now - unashamed - that when he drove her away my eyes watered and not just because I had to give her away for such ridiculous money. Cars like these are about the memories and the memories were not included in the sale. The new owner found out in short order how rough I had been with it because the chassis broke in half just months after he took it home. He sold it to a chap in Ludlow who was going to restore it, which was nice to hear. Me and my sister (visible in the window) driving along on a beautiful British summers day. I hope you enjoyed this little trip down memory lane, I'm sure the James May jokes will only intensify after this. I guess I will be Captain Slow for life. And if you know where BPF 32T is today, drop me a line I would love to know how she's getting on. This is great!!!! Phil Lee I need to see this on the purple S14! !Man I want a defender so bad!!! Awesome write up Phil. Sounds like you had some great memories relating to this thing and it makes for a very entertaining story. Glad you put this on here.